Hi, this is Rossie again with further instructions for screen printing! Did you gather up some t-shirts? Canvas bags? Quilting fabric? If so, fabulous. If not, get on it! Wednesday is quickly approaching! 1. Wash whatever you plan on printing. 2. Dry it in a clothes dryer if that's what you plan on doing once it is printed. You want to make sure that your markings are level so that when you print the t-shirt it won't turn out lopsided. You can verify that you've marked a level line by checking the sides...the tape should be the same amount down from the armpit seam on both sides. You should think about the location of the kelp strip so that it doesn't end up somewhere unfortunate on your bust. Figure out where you want that kelp strip and then mark a line on your shirt 2 inches above where you'd like the kelp strip. You should also mark the middle on the shirt (up/down). 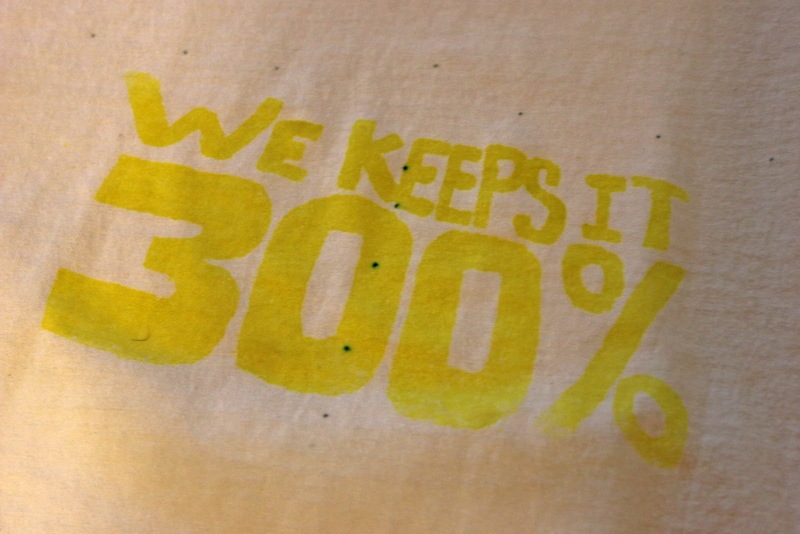 An alternative to using masking tape is using a water-soluble marker. Just put in a few dots as guides for placing the screen. Folding the shirt using the seams and then marking the fold works well. 5. Mount your fabric. Finally, for each item you plan on printing, take a piece of cardboard and some pushpins and mount the item onto the cardboard. This provides a nice surface to print on and prevents ink from seeping to the back of the t-shirt. Do not stretch the fabric, just lay it smooth and flat and pin it down. Brenda will bring extra cardboard and I will bring extra push pins on Wednesday. Hey ya'll! 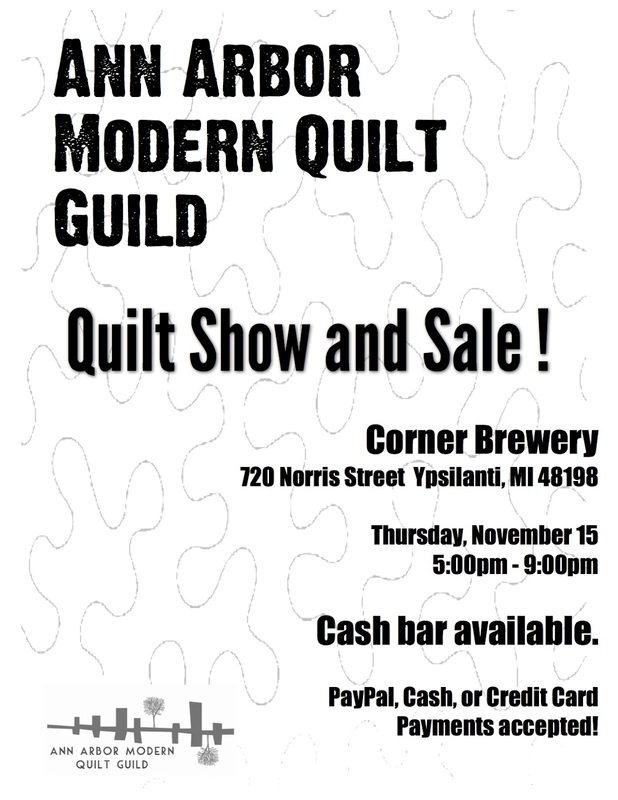 So as we discussed in our latest meeting, I went ahead and reserved the Lounge of the Corner Brewery for Thursday, November 15 from 5pm - 9pm. Please email me (jennaral AT gmail.com) if you plan on selling goods at this event. Once we get a head count, we'll figure out dividing the rental fee (I paid $100) and any poster/flyer printing costs (once we come up with a design - I just whipped up the above JPEG in a couple of minutes). Next Meeting: August 29 at 6:30pm at MakerWorks. 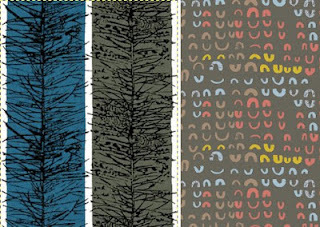 Bring a sewn item inspired by Lucienne Day if you'd like to participate in the swap. 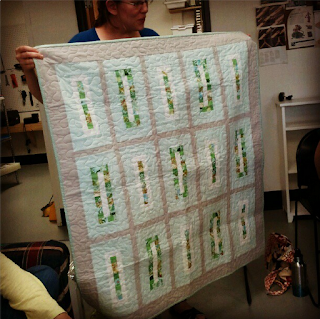 Ginia will do a casual lecture discussing what makes a quilt valuable and hold its value, as well as showing us some antique quilts. 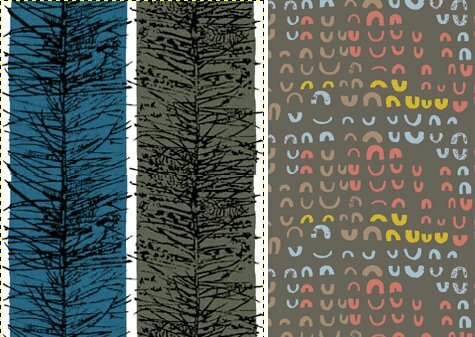 More information about Lucienne Day HERE, and HERE. No Sew-In in August due to the Retreat. 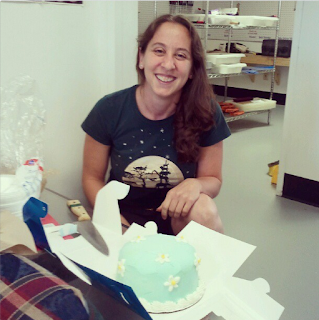 Hey it's Ronit's birthday on Friday and she brought Ice Cream Cake! Sewing Retreat: Attendees can now sign-up for dishes to bring or cleaning sessions. More information HERE. Screen Printing - Rossie has obtained the silk screens, the ink, and the brushes. 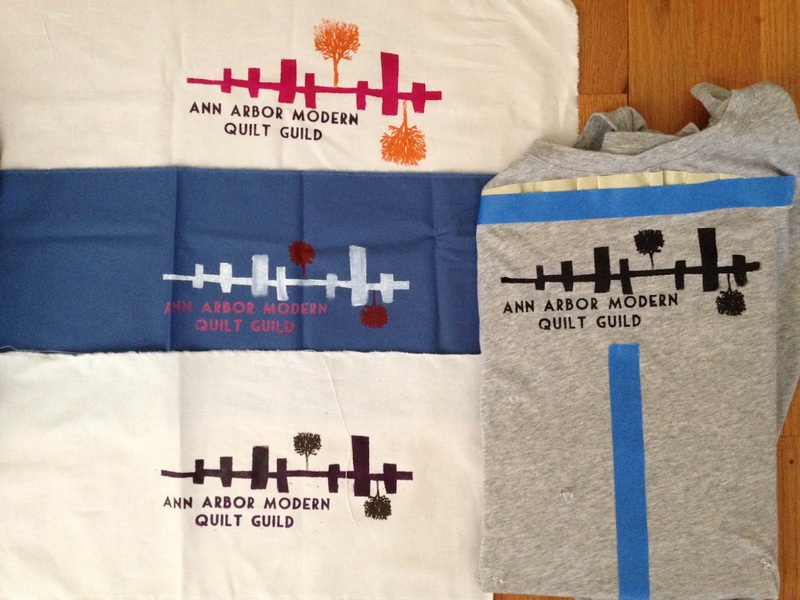 There will be an event on Wednesday, August 1 at 6:30pm where Rossie will teach us how to screen print t-shirts, fabric, or bags (or whatever). Location is TBD. Please bring whatever you'd like screen-printed, and $3-$5 to cover expenses. More information HERE. 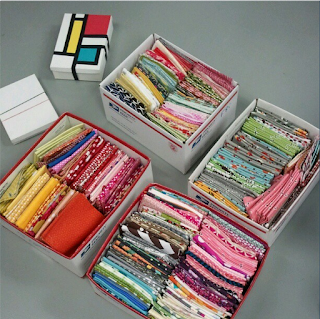 QuiltCon - more information has been posted regarding this exciting event. If you would like to come, you can email Brenda to see if she has space for you in the reserved hotel rooms. An A2MQG Quilt Show/Sale - Looking at hosting this event at the Corner Brewery on a Thursday evening in November. Details to come. Thia (sp?) from MakerWorks is looking for teachers for classes. Have an idea of a class you could teach? Contact MakerWorks and you'll be emailed more information. Show and Tell was nice! 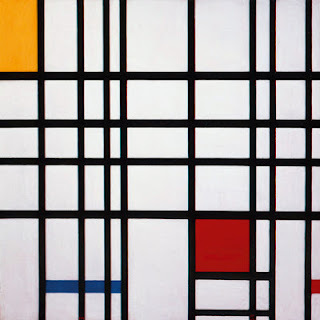 The swap of Piet Mondrian fabrics occurred, as well as more bargain bin shopping for fat-eighths, to much rejoicing. The food items listed are just suggestions. Feel free to substitute with similar items, but let's work to have a balanced menu that will cover all our needs. You are responsible for the costs of the food items you choose to bring (we're not divvying up the costs or doing refunds). Please make sure your name is on the spreadsheet at least three times, whether that means three food dishes, three cleaning sessions, or some of each. We have 10 people attending and 1 maybe. 4 of our attendees are vegetarians. There is a meeting tonight at 6:30pm at MakerWorks. If you want to participate in the fabric swap, please bring three fat quarters (wrapped up and unlabeled) of fabric inspired by artist Piet Mondrian. 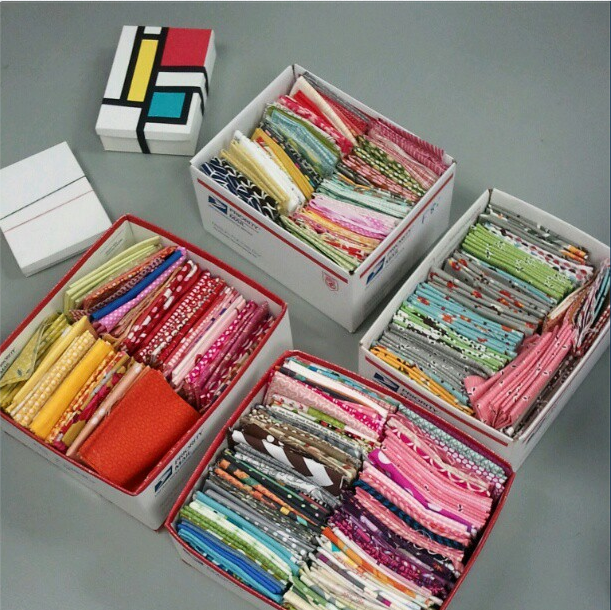 If you made blocks for the Quilt Con Block Challenge, please bring them. At the meeting tonight, we'll be talking about our upcoming screen-printing party. More deets on that HERE. Hi! 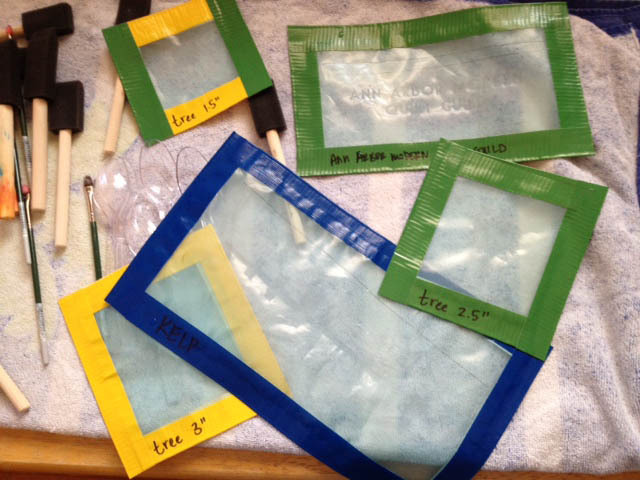 This is Rossie posting an update on our screen printing project, including what materials you'll need if you want to join in on the screen-printing fun. 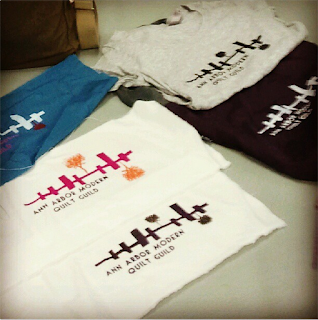 We'll be picking a day and time and location for printing at the next meeting. If you definitely want to screen print, but won't be at the meeting on the 25th, please leave a comment below with that information as well as any relevant scheduling difficulties you may have. I have the screens and the inks and I did some test prints and they came out great! These are made with Thermofax screens from Lynn of FibraArtysta (FibraArtysta). But in the meantime, all you really need to do is pick out or purchase whatever you'd like to print on. I'm giving you advance notice in case you'd like to order something online. I, for example, love t-shirts from Next Level Apparel, so I purchased a few on ebay from inprint. 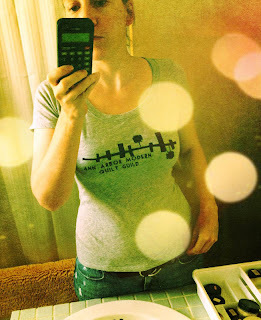 FYI: I think the sizing on these is pretty accurate. 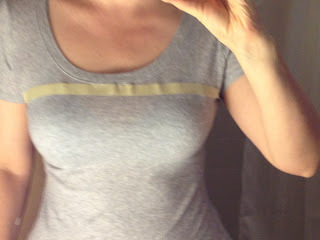 I usually wear a 10 or 12 and this is the Ladies Juniors Fit Cotton Scoop Neck Tee in Large. 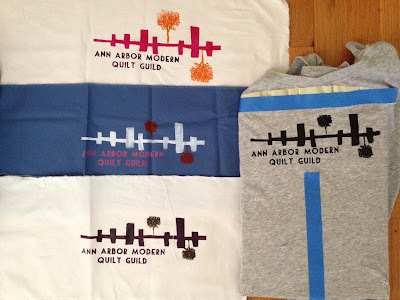 Whatever you want to print on: quilting fabric, t-shirts, canvas bags, get it and prewash it. 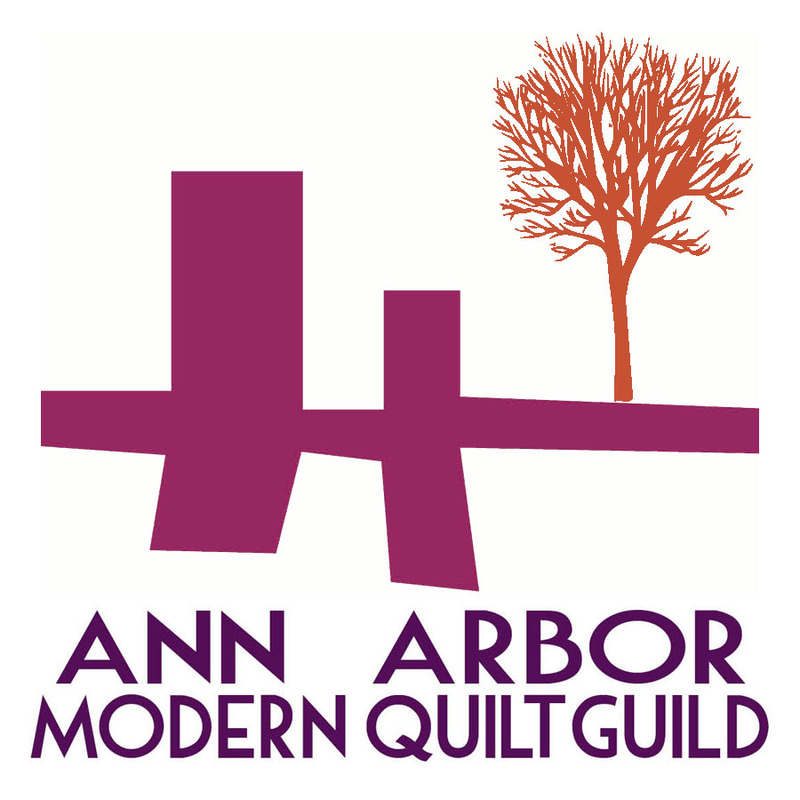 The logo is 9" wide and 3.3" tall with small trees. Or 9" wide and 5" tall with the larger trees. I purchased (for all to use) the colors we used in our logo + black in Jacquard Screen Printing Inks. I also have a small bottle of white. These are water-based and can be mixed. If you've got your heart set on another color, you should purchase that ink. 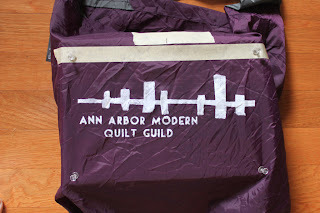 And put Ann Arbor Modern Quilt Retreat in the Memo. I am so excited about our quilting retreat. If you are planning on attending, please read this post. I need information from you! Here is our current guest list: everyone on the list is insured a space on the retreat - those of you who were on the waiting list are officially in! Hooray! There are still spaces available. If you are interested in attending, please contact Jenna (jennaral AT gmail.com) by JULY 10. 1. Pay your deposit. There is a $50 deposit due, per person, by July 17. Everyone who is attending will owe $110. If you would like to have a private bedroom with a Queen bed (as opposed to sharing a room with a fellow attendee of the retreat ) - it's an additional $35. WE WILL HAVE A FOOD SIGN-UP LIST AVAILABLE SOON. Keep checking this blog for more information!